payload masses (optimum, as calculated using phsstpok's Rule*) for new lead counterweight) 13.2 grams 0.466 oz. The uneven ground that the treb was fired from may account for the unusual differences in the ranges. On earlier trials I was able to get it to land in a small cardboard box about 4 out of 5 times. Construction photo - major components pegged and glued. The trough came later. The beam and all of the frame timbers are pine, cut from scraps left over from building my first trebuchet, Hotspur. It helped to have access to an electric joiner planer, a table saw, a compound mitre saw, a drill press, etc. 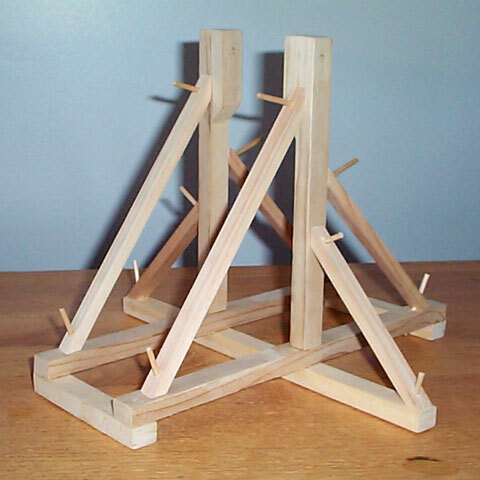 The pegs were cut from a 1/8" dowel, and glued in with Bondrite "Sand-N-Stain Woodworkers Glue", which is supposed to take a stain better than regular carpenters' glue. It took some fancy clamping to keep the timbers in place while I drilled the holes. Afterwards, I sawed the tops of the pegs off with a little hacksaw. As I mentioned before, I got the beam and counterweight built, and put a stain and shellac on the frame and beam, but got stumped as to how I wanted to do the trigger, sling, and pouch. Then, the bag of parts (including the beam, axle, CW, CW hangers, and miscellaneous hardware) disappeared for many months and the project stalled while the frame sat collecting dust. Yay! -- I found the arm, axle, and counterweight assembly. they were buried in a plastic bag in the laundry room. This was the screen test photo, before the sling and pouch were made. It also shows the old counterweight made out of large square washers. It was as far as I got last year, and I had demoed it then with a come-away sling‡. I happened to have some sample swatches of leather, which looked to be about the right size. I cut off one corner with an X-Acto knife, folded it, cut the other corner, opened it up and folded it the other way, and then cut the corners on the other end. I cut a slit about 1/4 of the width in one side, overlapped it to see how much of a V I wanted, then enlarged the slit to a V-cut. Next I folded it and cut the other notch to match (moere or less). 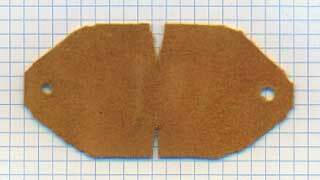 This leather tended to stretch under the knife, so it doesn't look perfectly symmetrical. It didn't help that the nylon cutting board was slippery. I took two of the triangular pieces from the corner cuts, and glued them (Lepage's "Bond Fast™" - a generic non-toxic white glue) like a patch over the notches, then clamped them between small scraps of wood at an angle, so that they only press on the triangular patches. I didn't want to clamp straight across the two sides because it would probably just flatten the pouch and defeat the purpose of the notches. I kept it clamped for 30 minutes, which is what they rcommended for wood. 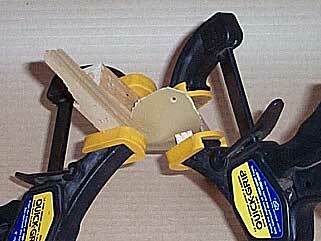 Man, I love those Quick-Grip clamps. Here's what it looks like from the edge. Just a little bit of "dish" to it. Note that I glued the suede sides together. It seemed like a good idea at the time. 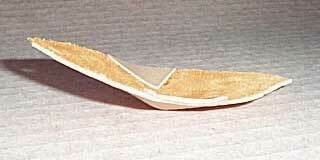 Maybe it would absorb the glue better than the smooth sides? I scored 3/4 of a gallon of discarded lead wheel balancing weights for free (thanks to "Ben's Esso", Sackville) and managed to melt some of them down. I poured it into the bottom half of a Coke can, and then turned it in a lathe just to pretty it up a bit, and to drill a 1/4" hole in the middle. 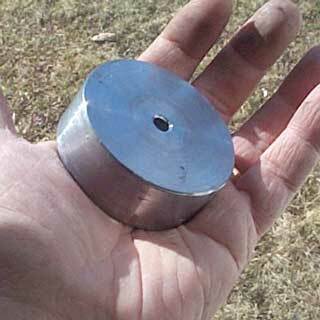 By the time I cut off the rough parts and drilled it, it ended up 62 mm diameter by 24 mm thick. I found a book in the Mount Allison University library, which had an illustration for a hook that was used to haul down the arm of an onager and as the trigger. 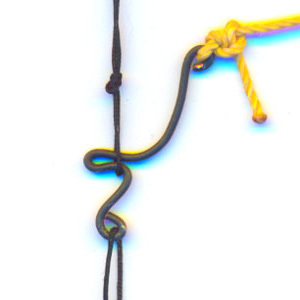 - The cord (40-pound test braided nylon fishing line) at the top is a loop hanging from the tip of the throwing arm. 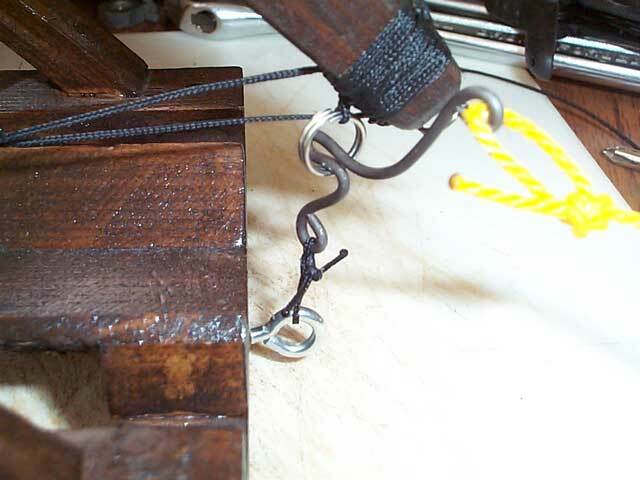 - The loop at the bottom is tied to an eye-hook on the base of the frame, just below the back end of the trough. - The yellow cord is the lanyard for firing it. I fashioned this one out of (I think) 16 gauge annealed steel wire. You get a lot of it for a few bucks, and it looks vaguely like wrought iron. The wire portion is 40 mm long. The curvature of the hook determines the amount of pull required to release the arm. I doubt I would want to use this for an onager (for safety reasons), but it seems suitable for small ("tennisball" class) trebuchets as long as you use heavier gauge wire (such as coat-hanger wire) or a thin rod. Original illustration from The Crossbow†, by Sir Ralph Payne-Gallwey, BT. May 11, 2003 - Finally finished and delivered. Beam axle, CW hangers, CW hanger axle, and CW axle. The beam axle used to be a four inch hook for a pegboard. Nice and strong, smooth and shiny. I learned how to use a tap-and-die set, just so I could put threads on the ends that would take a standard size nut. The aluminum spacers between the beam and the axle supports were a single spacer from a Radio Shack assortment, but cut in half. The nuts on the ends do not apply any pressure on the upright posts - they only make sure the axle doesn't slide out. The axle through the CW is a short length cut from a 1/4" threaded steel rod.The nuts on either side are the kind that have a dome on the end, so you can only tighten them until the rod bottoms out. 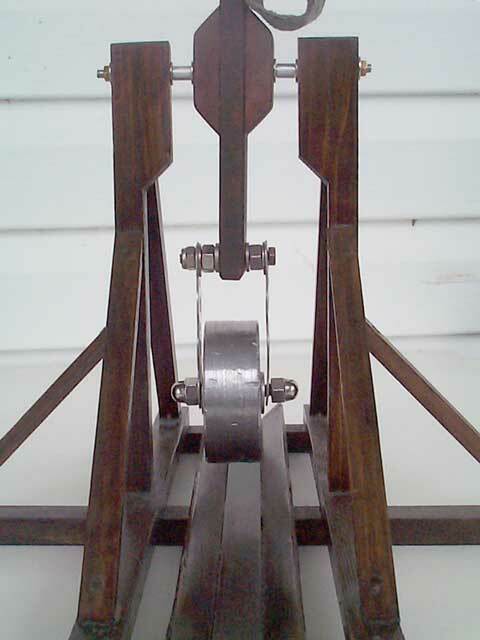 You want the CW itself to be able to spin freely, even though the CW only turns a few degrees when it's fired. 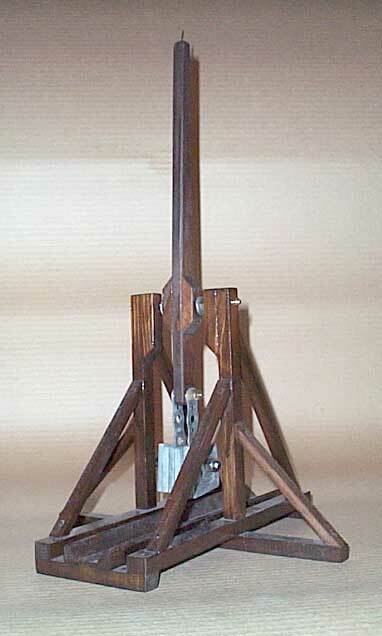 The sling was originally a bit longer, for maximum range. The bottom of the pouch was just a centimeter or so below the axle, but I think I shortened it so that it would release at a lower angle, for indoor use, instead of bouncing off the ceiling. Beam is cocked, but the pouch is not loaded. The cocking angle is 45°. The counterweight doesn't quite touch the beam. I made up six "LRF Extensions" for the base - little 1/4" dots of thin foam, punched out of a sheet of "Fun Foam", and glued on under the ends of the beams. The middle transverse base timber ended up a bit curved, and the LRFs kept it from rocking side-to-side, and to keep it from slipping when it's fired. Closeup of the trigger when it's set. Unfortunately, the flash bleached out the detail on the yellow trigger lanyard, but the important stuff comes out okay. I decided to use a little split-ring for the trigger, since the black nylon line was so hard to see when you're setting it. I found a package of them in the fishing tackle section of the Canadian Tire store. This is the sketch for the new (grey suede) pouch. It doesn't show the patches for the V-notches. The notch angle hould have been a bit bigger too, because the result was still a bit too flat for some payloads. I made it narrower than the yellow pouch, but I think it should have gone down to 3 cm wide. I have no idea why I wrote "60%", where I meant "60°". The terms of surrender were not satisfactory. We shall provide transportation back to the castle. Higher beam ratio. I didn't realise that I was going to be able to get as massive a counterweight as I did, with the lead. 5:1 Might have been a better choice. Wider trough. I'd make it the full width of the inside of the base. As it is now, the bottom of the pouch (being wider than the top) rests on the high sides of the trough, and it tends to tip down towards the trigger end, causing spherical payloads to roll out of the pouch. Dark Walnut stain is too dark. It looks okay in real life, but it's difficult to photograph, and it's difficult to see the black nylon line against it when you're cocking it and setting the trigger. Metal fixtures. Too many different colours. 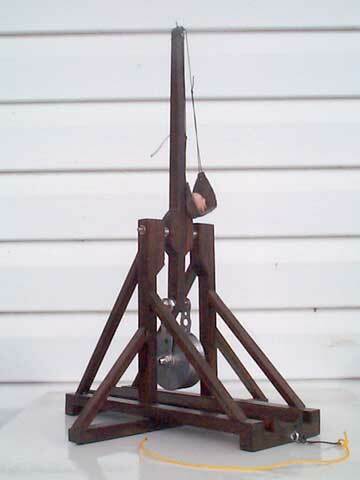 Next time I might try making everything out of brass, and construct a nice wooden box for the counterweight. Outriggers didn't need to be so wide. For the next update - I hope to have a complete list of dimensions of all of the components. 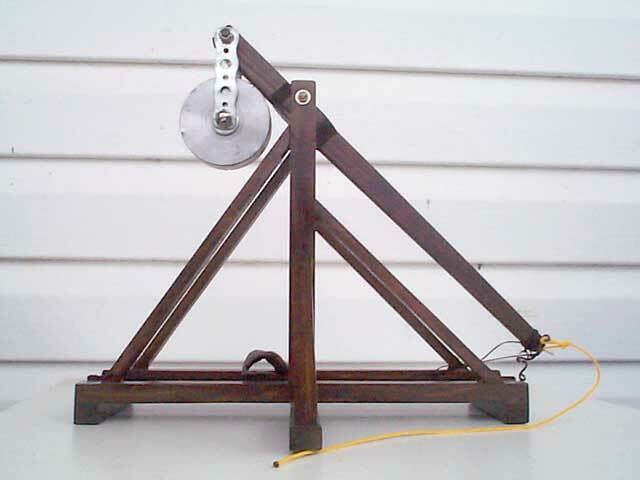 and mass ratio is the counterweight mass divided by the payload mass. I recently had an epiphany as to exactly why there is no point to increasing counterweight mass beyond a certain point, unless you increase the payload and/or the beam ratio. Until I make up a separate page explaining it, here's the discussion I started about it on the Cat Mess Board. † The full title is actually The Crossbow - Medieval and Modern - Military and Sporting - Its Construction, History & Management - With A Treatise On The Balista and Catapult Of The Ancients And an Appendix On The Catapult, Balista & The Turkish Bow by Sir Ralph Payne-Gallwey, BT., in 1903. Published by The Holland Press, London. ISBN 0-946323-14-3. 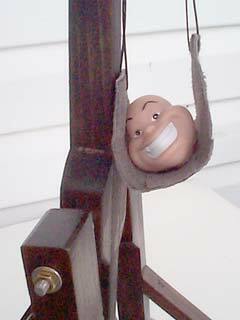 A sling that is simply a single cord attached to the payload, and a small ring to go over the throwing arm's release pin. It comes away with the payload when you fire it. Very useful for trying out different pin angles, counterweight masses, and sling lengths. Also useful for hurling payloads that don't easily lend themselves to being put in a pouch, such as automobiles and major household appliances.